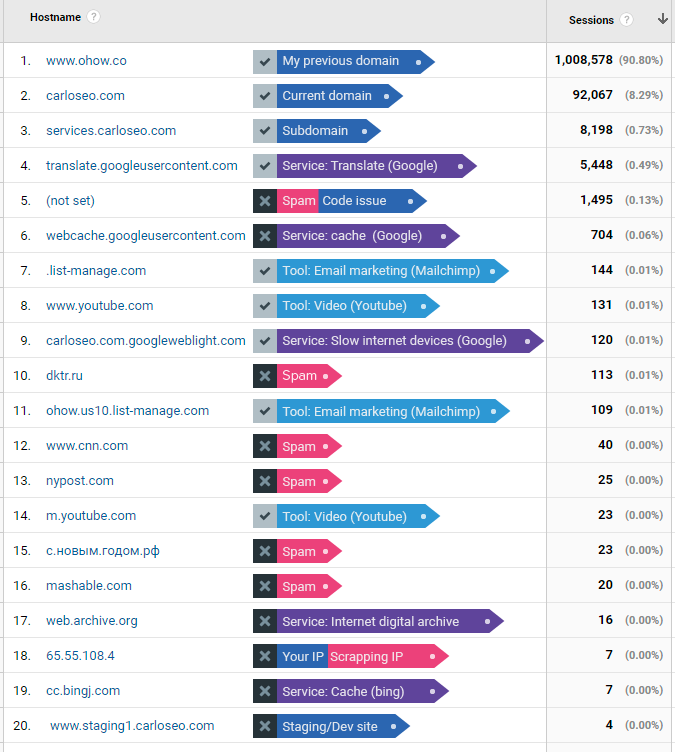 The hostname report is one of those underused reports in Google Analytics that can massively help the accuracy and data quality of your reports. Identifying sites that are scrapping your content. 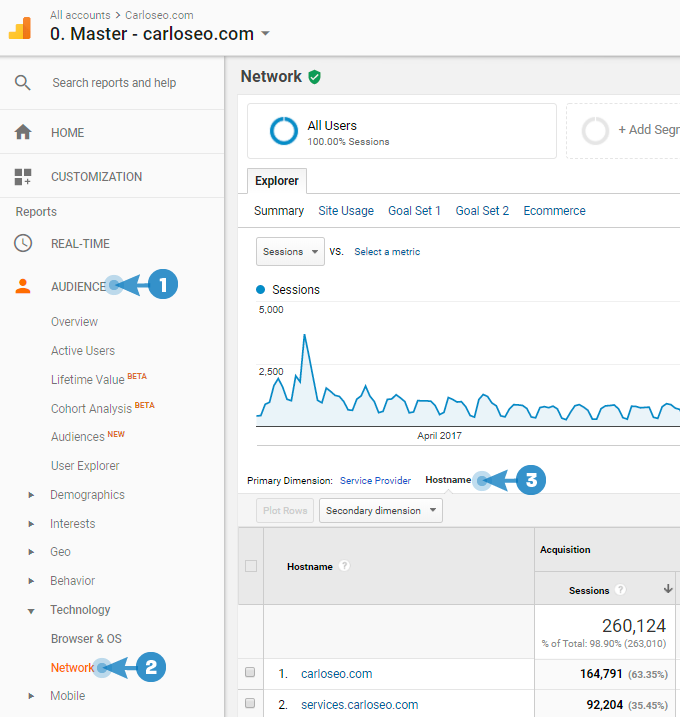 What is a hostname in Google Analytics? 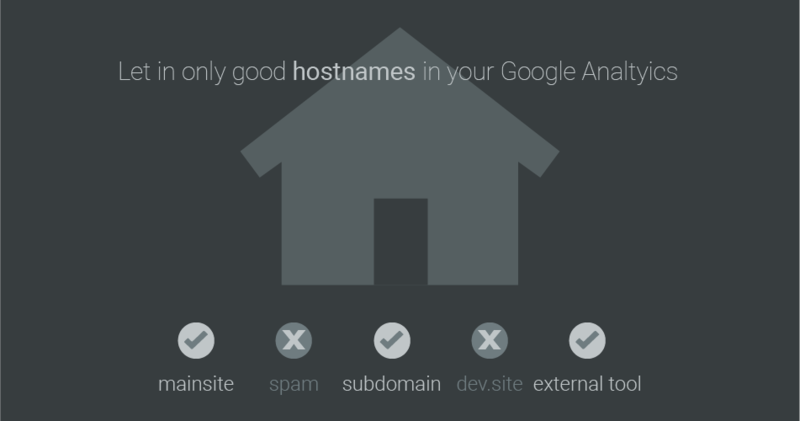 A hostname is any domain, tool, or service where your GA tracking code is present. They might be controlled by you or by an external service. An example of a hostname controlled by you is your website where you inserted your code. An example of a hostname not controlled by you is Google translate. Where is the hostname report in GA? One of the reasons why this report is usually overlooked is because it isn't located on the main list of reports, if you type hostname on the search box it won't appear. Go to the reporting section, select a year or more on the calendar, then select the Audience reports in the sidebar. Here you will see the list of the hostnames, real or fake (spam). The most important one is your domain, the rest will vary from site to site depending on the size, age, and configuration of your site. The following screenshot shows some of the hostnames stored in the analytics property of this site. You may think well all that is interesting, but how can I use it to improve the quality of my Analytics? You can use this information to create a filter to allow only traffic to the hostnames you consider relevant, that way any traffic that has an invalid hostname and doesn't add any value to your Analytics will be left out. So now that you know how to find and identify your valid hostnames make a list of all the ones you want to include in your filter. Following the example above, these are the hostnames I consider valid. Of course, if you have development environment like in my case "staging1.carloseo.com" the above expression would match that hostname. So here is where you will have to get a bit crafty by using a more advanced regex. The parenthesis and question mark are special characters, that basically says it has to start with "services" or with "carloseo", any other subdomain won't be counted. The dot . and the hyphen - are considered special characters in REGEX so normally you would add a backslash \ , however in most cases is not needed for this type of filter. 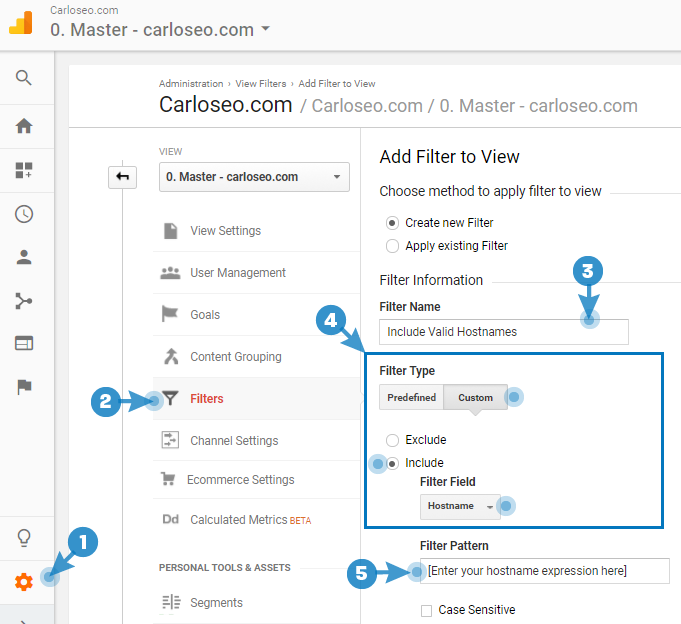 Try to find a good way to match as many hostnames as you can, for example, if you want to match blog.carloseo.com, es.carloseo.com, www.carloseo.com, you don't need to add all of them to the expression entering carloseo, will be enough to match all of them. Domains don't spaces so don't leave any in your expression. IMPORTANT! The REGEX in GA has a limit of 255 characters if your expression exceeds this limit try to optimize it to keep everything under one expression because you can only have 1 Include hostname filter. IMPORTANT! Don't add a pipe/bar |, at the beginning or the end of the expression. Using a quick segment in GA, this will let you see live how you filter will behave directly on your reports. Using a regex test tool like regex101.com, here is an example using the latest expression I created. You are almost there! All this read and work will be soon rewarded. 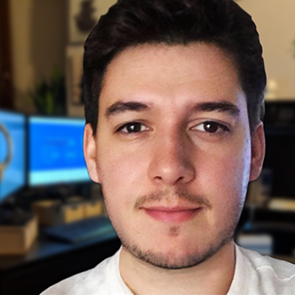 Once you have your expression fully tested it time to create the "include hostname filter" that will help you get rid of all the toxic traffic that skews your reports. Go to the Admin tab, and select the view where you want to apply the filter. If you follow the naming above, this will be the Master view or Test view. 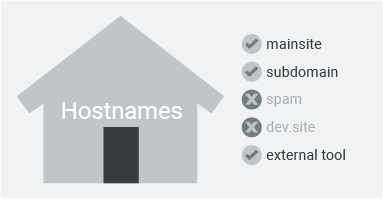 Enter as a name for the filter Include Valid Hostnames. In the Filter Pattern box copy the hostname expression that you built before. [optional] You can click on Verify this filter for a quick glance of how the filter will work. You should only see spam or irrelevant hostnames on the left side of the preview table. If you get this message: "This filter would not have changed your data. Either the filter configuration is incorrect, or the set of sampled data is too small"
It is probably because of the limited data used by this featureTry verifying it with a quick segment (if you haven't done it yet). After making sure your filter is ok, Save the filter. IMPORTANT: This filter doesn't require regular updates, but it's essential to update the expression whenever you add the tracking ID to new service or domain. The hostname report can greatly help you to increase the quality of your data. With the information given there, you can create a solid filter that will allow only the pass of valuable data. Depending on the configuration and size of your site it might be less or more difficult to configure the filter, however, the results are worth the time invested on preparing one of the most important filters you could add to your analytics. If this article helped you, consider sharing it or leaving a comment below on your experience, it may help other people!